Your customers can receive an annual subscription to Concrete Decor, compliments of your company, at NO COST to you or your customer. Each issue of Concrete Decor is sent to your customers with your personalized company name and contact information printed directly on the magazine. For a full year, your customer or prospect is reminded of your company and will appreciate receiving the only magazine devoted exclusively to decorative and architectural concrete. 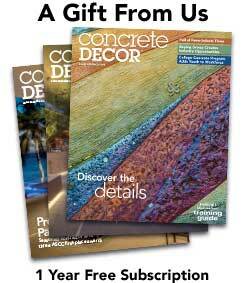 The custom URL will invite your customers and prospects to sign up to get their complimentary subscription to Concrete Decor magazine. BONUS: When your customers and prospects subscribe to Concrete Decor magazine via your custom URL, all the demographic data we collect from them will be provided to you via your personal login and can be used in your company’s marketing. 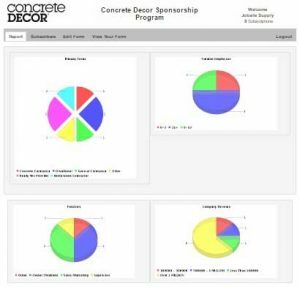 The subscription sponsorship program has proven to strengthen the professional relationship between you and your customers and is a great way to increase the understanding of decorative concrete’s role in a business’s success. Participating in this free service ensures that Concrete Decor magazine is in front of your customers on a regular basis. Individual programs renew annually. Getting started is quick and easy! Call us today at (877) 935-8906. Note: Concrete Decor holds all information strictly confidential and does not rent or sell its lists to anyone.